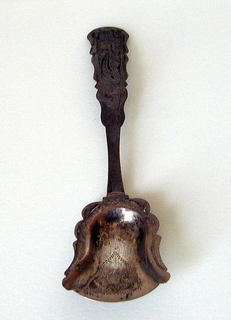 The tea scoop with bell-form, shovel-like bowl with shaped, flat flanged border. The bowl and border engraved with flower and wriggle work. The tapering handle with slightly down-curved, shaped terminal. The terminal obverse engraved with partial flower and scrolls with an oblong reverse.